We left Cockerell Creek this morning just before sunrise. 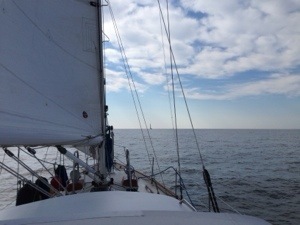 The bay is calm with light winds out of the west so we are motor sailing at about 7.5 knots and should arrive at mile 0 of the Intra Coastal Waterway before 5. Wolf trap light in the background.